John awakes to find himself in a hospital bed with no memory of how he got there. Then the visions start. Destruction and death. A last chance. The only one who can save millions of people. He is no hero. I wish I could write a review as well as the author wrote this book to do it justice. 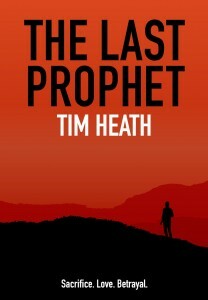 Another magnificent literature masterpiece from Tim Heath. I really enjoy the concept of the story-line which I must recommend to anybody into thrillers and high tech espionage. The frightening thing about it is this could actually be fact one day! Thrillers don't normally encourage you to ask such questions: Is this all there is to life? Can there be hope despite the certainty of death? Once bad, always bad – but can a person perhaps change? Is it possible to redeem oneself – perhaps through a heroic act or through one's love for others? Can one person sacrifice himself for everyone? Is it ethical for the community to sacrifice one person's life for everyone else's survival? Is it ethical to lie or even to build a web of lies in order to save many from destruction? And yet despite – or perhaps because of? – these deep philosophical questions we are kept in suspense until the last page. I have to say that I massively enjoyed this book from beginning to end. I enjoyed the plot, the characters, the ideas, the developing urgency of the story and the underlying theme of sacrifice. I enjoyed the mixture of covert teams operating against each other and the ensuing action well researched and thought through . In fact I can actual see something like this taking place one day-who knows, this may well be a Prophetic book! International espionage and sneaky twists provide the backdrop to some heart-wrenching decisions for the people we meet along the way. Not afraid to ask the big questions, The Last Prophet foretells a journey none of us would ever wish to make. If you like your thrillers with a dash of apocalypse and a side order of sacrifice, check this one out! Very good read. Couldn't put it down. Brilliant from beginning to end and very thought provoking. We are going to read it at our Book Cub next time. Thank you Tim. This is an exciting fast moving story. Just as you are beginning to understand what is going on, a new factor comes into play and new complexities appear. Right up to the end it is not clear which way it will go and I couldn't put the book down. Great read by a great author! A thriller in the traditional sense, but with an edgy provoking setting. The use of tension and revelation perfectly balanced to keep you turning pages late into the night. Political intrigue, together with subtlety revealed plot twists keep the reader alert and motivated to uncover the truth ahead of its telling. 3D characters challenge you to examine human nature and personal boundaries. A satisfying read with refreshingly strong female characters. ★★★★★ A Riveting Spy Thriller! MI5, MI6, the South African Secret Service, and the Chinese–What More Could You Ask For! A Riveting Spy Thriller! MI5, MI6, the South African Secret Service, and the Chinese–what more could you ask for in an international spy thriller. You have shadow governments, or rogue governments–or is this really the normal operating procedures for nations who want to take down their enemies, in revenge for spying on them? And all of this wrapped up in the ethical dilemmas of deciding whose life is expendable, and whose is not. John Westlake awakens to find that his memory is gone, but his nighttime's are filled with visions of a sacrifice that he has to make to save the world. Are these visions from the unknown or are they being fed to him, and for what purpose. And will his nurse, Lorna, help him to make this decision on his own? I highly recommend this book. If you love Tom Clancy books, Mission Impossible, or anything conspiracy theory based with spies, espionage, and shadow governments, you will not be able to put this book down!